Congratulations, you've just found the best ever mac and cheese recipe! Your search is over. Seriously. This is one my most requested recipes, though I must admit, it's not even mine. I appropriated it from Beta Wife. One of the perks of marriage, what's mine is yours. So of course I claimed it for my own. 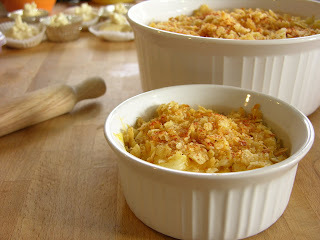 There's no fancy cheese, just cheddar and elbow mac, and a few other creamy additions. For the topping I've come to prefer crushed kettle chips over the cracker crumb topping that I used to use, so pick your favorite. 1. Start boiling the pasta. 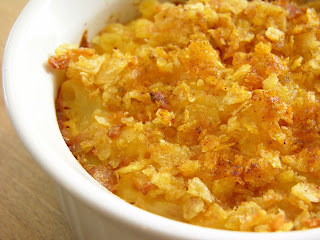 Use butter and grease a casserole dish (about 2 quarts in size). Pre-heat the oven to 350°. 2. Grate the cheese and prep the onion, so that they'll be ready to add about the time the pasta is finished boiling. 3. Strain the macaroni and return to the pot you boiled it in. Then add the cheese, onion, mayo, sour cream, and black pepper, and integrate until well mixed. 4. Pour the mixture into the greased casserole dish and top with crushed crackers or chips, and sprinkle lightly with paprika if desired. 5. Bake for 45 minutes at 350°. It's a blog with a short attention span...throwin' a party in your mouth since 2008. 5 vodkas that all taste the same… and are cheaper than Grey Goose. Great news, readers! Now you can have Alpha Cook delivered right to your inbox. Just put your little email address in here and click. You won't be sorry. Comments, questions, unclaimed winning lottery tickets, and job offers can be sent to: thebigcheese [at] alpha-cook [dot] com. All photographs were taken by the author and are property of Alpha Cook, unless otherwise stated. To use an image, please contact me by email for permission. ©2008-11 Alpha Cook. All rights reserved. These materials and images may not be used or distributed without permission. Can't Find It? Search Alpha Cook!